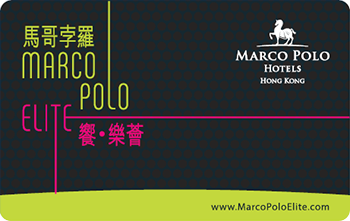 On behalf of Marco Polo Hotels – Hong Kong (Marco Polo Hongkong Hotel, Gateway Hotel and Prince Hotel), we are delighted to welcome you as a privileged member of MARCO POLO ELITE. MARCO POLO ELITE membership brings you a world of privileges designed to enrich your experience every time you dine at any of our exciting restaurants and bars or stay in one of our hotels. 25% discount on the total food and beverage bill for one (1) person up to a maximum group size of ten (10) persons dining, during normal dates at any hotel operating restaurant of Marco Polo Hotels – Hong Kong. 25% discount is not applicable in lounges and bars, blackout dates, special events, any other promotional or discounted activity. 25% discount on food and 15% discount on beverages in lounges and bars. 15% discount on cakes and pastries. 10% flat discount during blackout dates, special events, or any other promotional activity. Members may enjoy a special room rate (subject to availability) for accommodation at Marco Polo Hotels. To enjoy this special rate, members must state their membership number at the time of reservation and present a valid membership card upon check-in. 20% discount on the Best Available Rate (BAR) for any room type. Available at any Marco Polo Hotels or Niccolo by Marco Polo. 10% discount on the best rate for an upgrade to The Continental Club Floor or Suite. Available at Marco Polo Hotels – Hong Kong. The above benefits are applicable only to accommodation used by the member and cannot be used in conjunction with other preferential discounts and corporate rates. Offers are subject to room availability. For reservations or enquiries, please call (852) 2113 3115 or email to resv.hkh@marcopolohotels.com. 20% discount on the following items during your stay: room service, laundry and mini bar. Available at Marco Polo Hotels – Hong Kong. Eight (8) TWO HUNDRED AND FIFTY HKD (HKD250) Cash Certificates valid for F&B or Rooms usage. Certificates may be used in conjunction with membership card discount. Only one (1) cash certificate may be used per table/per visit. One (1) Birthday Cake Certificate valid for a signature cake when celebrating Birthday with any food and/or beverage consumption at any hotel operating restaurants during the month in which it falls. Certificate may be used in conjunction with membership card discount. Only one (1) certificate may be used per table/per visit. One (1) 50% off Dining Certificate. Enjoy a 50% off any food and beverage consumption, valid for four to ten (4 – 10) persons at Cafe Marco or at add@Prince. One (1) Complimentary Bottle of House Wine Certificate. Enjoy a complimentary bottle of House Wine when dining with a minimum of two (2) persons. Three (3) Suite Experience Certificates, valid for a TWENTY FIVE percent (25%) discount on the Best Available Rate for Suite including breakfast for two (2) persons with Continental Club Lounge visit for one (1) to four (4) consecutive nights. Subject to room availability. Children policies apply. TRANSFERABLE. Three (3) Continental Club Lounge Visit Certificates. Member is entitled to a Continental Club Lounge visit for an additional charge of FIVE HUNDRED HKD (HKD500) per night upon checked-in. Children policies apply. TRANSFERABLE. Member shall receive One (1) Complimentary Supplementary Membership card and one (1) 50% off Dining Certificate, valid for a 50% off any food and beverage consumption from Sunday to Thursday for a maximum of ten (10) persons at any hotel operating restaurant of Marco Polo Hotels – Hong Kong. Member shall receive One (1) Complimentary Bottle of House Wine Certificate. Enjoy a Complimentary Bottle of House Wine Certificate for every successful referring candidate who joins Marco Polo Elite. Certificate valid when dining with a minimum of two (2) persons. One (1) Complimentary CLUBHOTEL membership card. Members shall maintain sole discretion to decide whether they want to join the CLUBHOTEL network. For more information, please refer to http://www.clubhotel.com. Membership privileges and certificates are non-transferable and must be used by the member.